I think it must have been the invasiveness that made them unfashionable - the Tiger Eyes variety sounds promising in that respect. Maybe that'll rehabilitate the species! The fashion will come back round again. There's a 1970's re-discovery in the UK at the moment, which I find disturbing. Having lived through the 70's as a teenager I was very glad to see the back of them. (Our bathroom walls were avocado - in fact the whole bathroom was.) 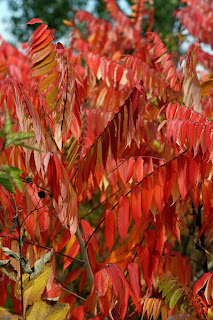 However, I'd happily look at a sumac.